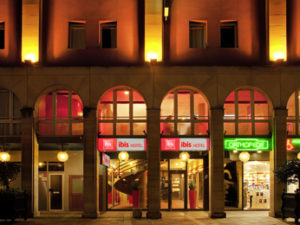 Ibis Epernay Centre Ville is a modern, comfortable 2* hotel located in the centre of Epernay. Located in a quiet area of the centre of Epernay, there is a pedestrian square next to the hotel. Restaurants, bars and the prestigious Champagne Houses are all within a few minutes’ walk and the English-speaking reception staff are on hand 24 hours a day to make recommendations. With 65 rooms, this modern-styled hotel is equipped with twin, triple, family and disabled rooms to cater for every requirement. Available facilities include a breakfast room serving a continental buffet, with large windows overlooking the pedestrian square. Free wireless internet access is available throughout the hotel and the welcoming bar serves drinks and light snacks throughout the day and evening. Wake-up calls are available on request and a fax machine and safety deposit box are at your disposal at the reception. There is a nearby underground public car park for those who are driving to the region at a cost of around seven Euros per night. The rooms at Ibis Epernay Centre Ville have recently been renovated and are clean, comfortable and well-maintained. Each room is equipped with a direct dial telephone, a TV with satellite, a desk, a wardrobe, a hair dryer and en suite facilities.